The viola part for the Overture from Wagner's Tannhäuser has been edited by Israeli-born Yizhak Schotten, an internationally acclaimed musician whom STRAD Magazine has called "one of America's finest viola players... a leading light of the U.S. viola establishment." Schotten's bowings, fingerings and other editorial markings have been added throughout the score. Tannhäuser is a three-act opera by Richard Wagner, based on the two German legends of Tannhäuser and the song contest at Wartburg. The story centers on the struggle between sacred and profane love, and redemption through love, a theme running through most of Wagner's mature work. Wagner began composing Tannhäuser in 1843 and completed the full score in 1845. The opera's famous overture, often played separately as a concert piece, was written last. 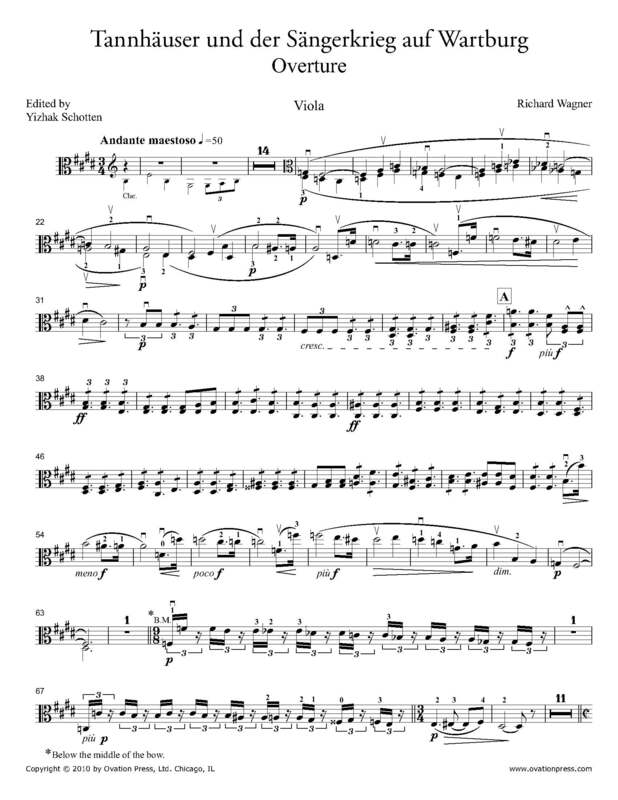 Download and print the score today to gain access to expertly edited Wagner Tannhäuser Overture viola fingerings and bowings from Yizhak Schotten!